This morning I was woken up from my slumber by the sound of a sharp buzzer, that can be found at the entrance to my apartment. Thankfully, the only person usually disturbing me before 9am on a Saturday morning is the mailman (or postman as we prefer to call them in the UK). After the usual pleasantories and a quick swirl of the pen, I was presented with two packages, that contained (amongst others things) three cards featuring one Dennis Keith Rodman. There is clearly little point in me writing anything about Rodman himself. Anyone with a modicum of knowledge of the NBA will have come across him. 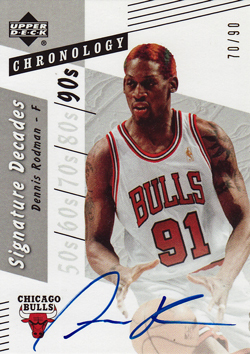 Amongst the myriad of tattoos and piercings (which was an uncommon sight on the court 15 years ago compared to today), the different hair colour every week, bizarre 'dress' sense and headline making relationships with the likes of Carmen Electra and Madonna, people sometimes seem to forget that on court, Rodman was an absolutely superb rebounder, defender and overall competitor. As someone who believes that a little controversy adds to rather than takes away from the game, I was always a fan of Rodman. 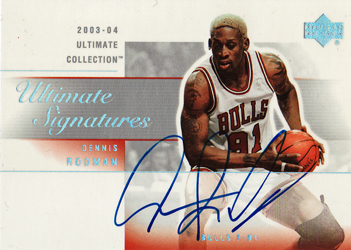 As to the cards themselves, the 2003-04 Ultimate Collection Signatures is my favourite of the three both in terms of layout and the autograph itself. I am a fan of clean and simple designs; whilst the autograph is a little less frugal than it's later counterparts. 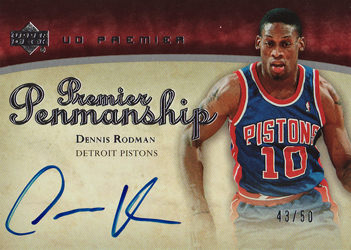 But I certainly have absolutely no complaints with the 2006-07 Chronology Signatures Decades and 2008-09 UD Premier Penmanship cards. Three smart additions to my 1990s legends collection. Special thanks go out to fellow Hobby Kings member deeluxe who sorted me out with the Ultimate Collection & Chronology cards and shipped them to me in double quick time!